Unlike most medieval books, which were designed for private or scholarly use, the size of this manuscript reveals that it had a public function. Graduals were large books from which choirs of monks, friars, or nuns chanted prayers and portions of the mass. 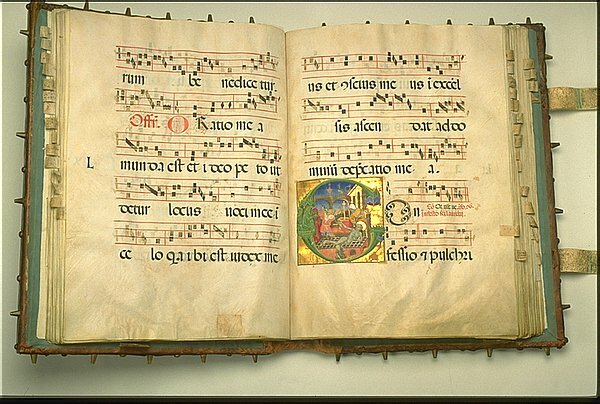 Lines of music and text alternate on the vellum pages, which are embellished with images depicting the lives of saints or stories from the bible. Although the words and music could be read from a distance, the intricacy of the illuminations rewards close inspection. Here, the initial c depicts the martyrdom of st. Lawrence, grilled alive while the king watches from a balcony. The symbolism in the illustration would have been instructive to the medieval viewer: the well refers to baptism and the vases refer to the church treasures, which lawrence sold to feed the poor. The prominence of architecture in this scene is typical of the international style, in which painters were often architects as well. To withstand daily use, this gradual is bound with embossed leather stretched over wooden boards. Metal bosses, or ornaments, decorate and protect the cover, and a metal tab provides support for the text block when it is used in an upright position. Use of Paris. France. ca. 1405-1415. Most of the colors were produced from animal or vegetable matter. The gold, however, was actual thin gold leaf or powder, and the blue was manufactured from lapis lazuli, which was imported from across the sea--hence the name "ultramarine." These books were expensive to produce, and were signs of great wealth. From the religious view, though, the extravagance and beauty of these works were essential; creating them was an act of devotion. By seeing the beautiful, one could approach god, the ultimate beauty.